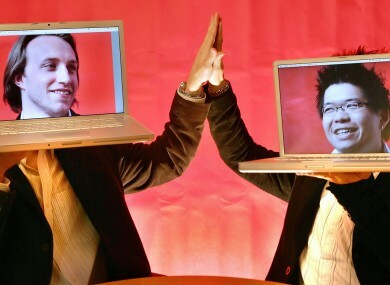 Two of YouTube's co-founders, Chad Hurley and Steve Chen. PRACTICALLY EVERYONE KNOWS what YouTube is and how it’s effectively the face of online video. What you might not know about it is how it started off life as a dating site called Tune in, Hook Up, and registered the domain name on 14 February. Its co-founder Steve Chen, who left the company and is now launching a new live-video site dedicated to food called Nom, spoke about YouTube’s early days at South by Southwest. When he and his other co-founders Chad Hurley and Jawed Karim were creating the site, they felt the obvious application for video was to use it for dating, according to CNet. “We always thought there was something with video there, but what would be the actual practical application?” he said. “We thought dating would be the obvious choice”. While that didn’t work out – simply because nobody had uploaded any videos and it was 2004 – they decided to ditch the entire dating concept and instead allow users to upload any video onto the site. That change helped the service become what it is now, but before it did, two unrelated events in 2004 helped shape the site to what it is today: Janet Jackson’s wardrobe malfunction at the Superbowl and the Asian tsunami. When Karmin struggled to find footage of either event, he proposed the idea to his co-founders and the site became what it is today. The site was later bought by Google for $1.65 billion in stock in 2006 and has launched the careers of many video creators like PewDiePie, the Fine Bros and Zoella. It has also launched a subscription service called YouTube Red in the US and its own gaming portal for livestreams and let’s play videos. When asked about why they registered the site on 14 February, Chen said it was “just three guys on Valentine’s Day that had nothing to do”. Email “So you know the story of how YouTube started life as a dating site...”. Feedback on “So you know the story of how YouTube started life as a dating site...”.